Firefighters work to extinguish a fire on Cora Street in San Francisco. 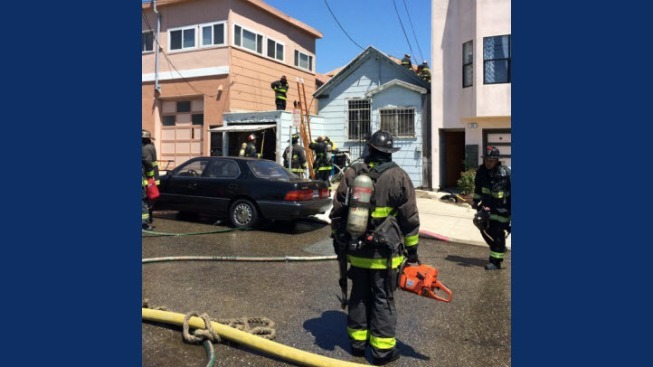 A man was critically injured in a one-alarm house fire Tuesday in San Francisco, fire officials said. Firefighters responded to a call at 2:10 p.m. reporting a fire at a home on Cora Street in the city's Visitacion Valley neighborhood, according to San Francsico Fire Department spokesman Jonathan Baxter. When crews arrived, they found a man with critical injuries. He was transported to a trauma center, Baxter said. Firefighters were working to extinguish the fire Tuesday afternoon and asked residents to avoid the area.